Curiosity is always my weakness. I’m curious about everything. Some might take my curiosity as stalkerish but really, I don’t mean any psychotic harm. I’m just curious. 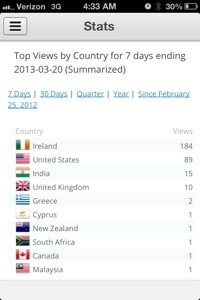 I was checking out the stats earlier and I noticed my blog had views from around the world. That just made my night. March 15th I had 210 views. To me, the fact that my blog was looked at that many times made me stoked! The fact that that many people (or one person obsessively clicking) my blog and reading what I have to say… I just want to say THANK YOU!!! writing is my passion (and bitching) and I’m just tickled pink. Now how am I supposed to go to sleep in that mini high?! I stumbled across your posts by accident, and once I have read about a half dozen, I knew I had to go back to the start and read the whole thing right through. I couldn’t help it. Your story is too interesting to miss out on. I found myself engrossed. Well done on an excellent blog. You deserve every “click”. Aw thank you!!! I love hearing that my blogging has interested people enough to read and keep reading. Thanks for reading!! !